The director for IFL, Philippines, met us on arrival — near midnight — to talk and have a cold glass of iced tea (our common way of greeting). We expressed our love for one another. She had personally outfitted our quarters with food so we did not have to deal with extra things that first day after flying half way around the world. Others had helped prepare our spaces and even made our bed. The children hear that we are here. It’s exam week at the IFL Christian school, so outside of the exams the children have some free time. Many little ones, who are close to us, gently knock on our door to come see and talk to us. We visited one of the children’s homes to see some of the staff and children on the first day. We walked at the end of that first day as we usually do. Those walks give us time to see and talk to staff and children before sunset. One young lady we love as a daughter came to our quarters to spend time with us. The next day a little boy came to talk and look at books. 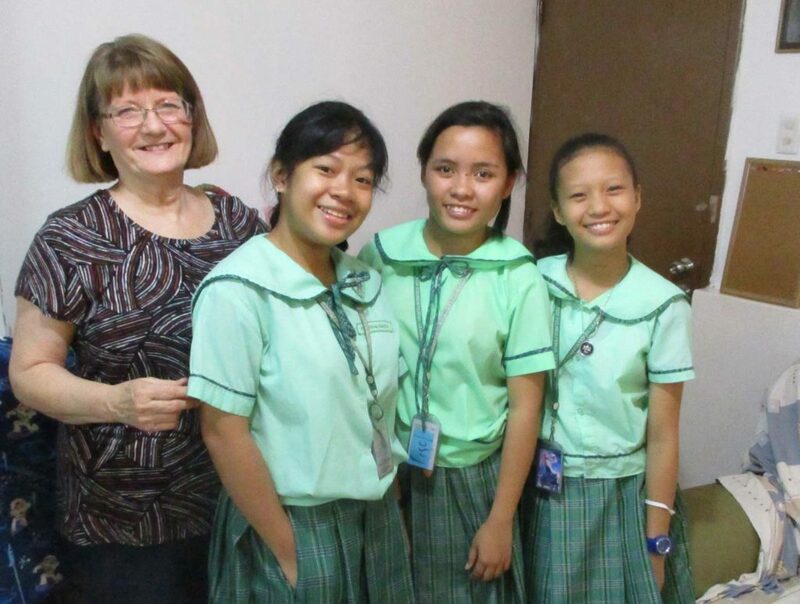 Three young elementary girls came a little later for the same thing, then posed with Faylene for a quick picture. The principle of the school came the first day to hug and greet us. Later that day she and her husband shared a plate of food. Three staff members came for coffee and toast this morning. The science teacher met with me for a half hour a little while ago. I toured the school and visited offices as I usually do every day we are at our mission station. No walk occurs without a few children running up and wanting to be gently thrown in the air, set down, and hugged. They know us and we know them. The “canteen” for the school is run by friends. We greeted and hugged them. We catch staff on the run but there is always time to stop, greet, hug, and plan to meet together. Several of the maintenance staff are good friends, too. We enjoy greeting them during those walks on the compound. What is the bottom line? We love each other and serve together with our Philippine friends. Shouldn’t it be that way? Our open door policy in our home, wherever it is, and started many years ago. Faylene and I, each in our own sets of circumstances, experienced the love and reach of God to those around us by exercising hospitality. Now we do it together as husband and wife. It is a lifestyle and a critical part of what we do because it undergirds anything we say. This is true wherever we are. We teach, train, and encourage believers on the truth of the Word of God as it pertains to biblical creation: how the universe began, what happened in the heart of man, why we need to be saved from our sins, where we are, and where we will end up. The subject forms the very context for the Gospel, but anything said must be accompanied with the love of God. That “accompaniment” is the exercise of practical love and hospitality. Otherwise, the words are lacking the very element God considers so important: His love. Our mission time is underway. Tagged children, creation, hospitality, love, Philippines. ROland and Momma Faylene- you bless me tremendously with your words…I love you!